Murphy Stidham thought she was simply walking into her regular weekly appointment at Mayo Clinic’s Ambulatory Infusion Center in Florida. 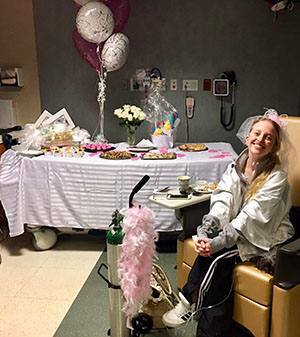 Instead, she walked into a surprise wedding shower put together by her care team. The Ambulatory Infusion Center at Mayo Clinic's Florida campus, like many other areas at Mayo Clinic, is in the business of saving and extending lives. The patients it serves "have autoimmune diseases, so they have to have monthly or weekly [blood] infusions in order to maintain or enhance their lifestyles," Trina Steffan, a nurse at the center, tells us. One thing the center is not in the business of providing — usually — is surprise wedding showers. 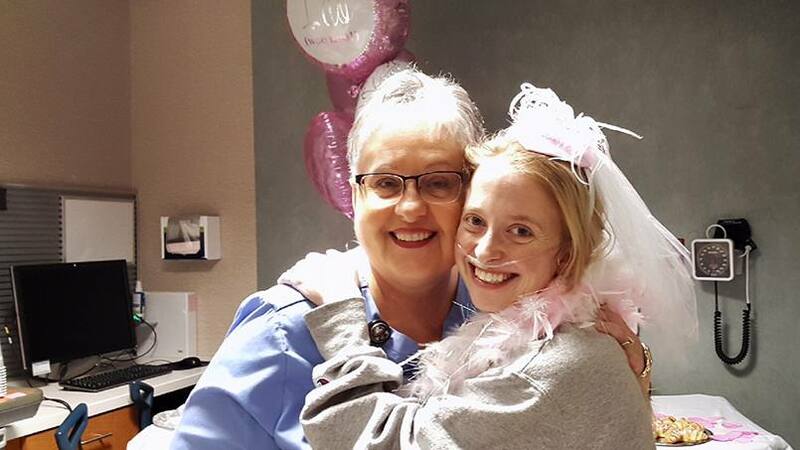 But when Murphy Stidham and her fiancé decided to move up their wedding date so they could say their I-dos before Murphy was listed for a lung transplant, the team at the center started working overtime. Murphy's Mayo Clinic story began six years ago, when she became a patient at the Ambulatory Infusion Center after "graduating" from the pediatric hospital where she'd been receiving treatment for a rare genetic lung disease. "Mayo Clinic is my first adult hospital experience," Murphy tells us. "That was a little nerve-racking because it's a completely different environment than pediatrics." But it didn't take her long to feel at home at Mayo Clinic. "The nurses in the Ambulatory Infusion Center all kind of took me under their wing and became really great friends of mine," Murphy says. "And now, I consider them my family since I've been going there for so long." The feeling, as they say, is mutual. "We just love her to death," Steffan says. "She comes in here every Friday, and we all just feel like a mom to her." Which is why, Steffan tells us, it was only natural for Murphy's care team to come together to throw an impromptu wedding shower at the center. "She'd wanted to have a regular wedding, but when she was placed on the transplant list sooner than expected, everything got moved up because one of Murphy's biggest desires was to get married before her transplant," Steffan tells us. "She was coming to see us the day before the wedding — on a Friday — and so I asked her if she was coming in the morning or the afternoon. And she said morning." That was all Steffan would need. "We all just came together to throw her a little bridal shower," Steffan says. "She was very surprised." More like blown away, Murphy tells us. "I walked in and they had a whole buffet of food, balloons, virgin mimosas, pictures of myself and my husband, Dan, and other fun knickknacks," she says. "They were all hiding in the supply closet and came out and surprised me — the whole team. They were just amazing, and it really just blew me away because they didn't have to do any of it. But it meant the world to me. I just feel so lucky to have been placed in the right hospital with the right care team because they've all been so wonderful to me." You can do something wonderful by sharing your comments below. Then, use the handy social media tools atop this page to share this story with others.